And if you LOVE BLING like I do, then OBVIOUSLY you need a way to SHOW IT OFF! As you can see from the picture below, I made my own Bib/ Medal holder (DIY, what what, I am pretty talented, huh?!). It worked for a while, but I was completing more and more races and needed something a little more substantial. The AMAZING folks at Allied Medal Displays stepped in and offered to send me an ABSOLUTELY AWESOME medal rack! I was able to pick out any of the displays, which I have to tell you, was an extremely difficult and daunting task. THEY ARE ALL SO GREAT! It took me quite a while to go through them all, but I was particularly attracted to the Magical Design racks! I mean, I am drawn to the runDisney events because they incorporate my love for Disney and fitness, so to have a medal display to show this is ASTOUNDING. After much deliberation, I finally decided on the Every Mile is Magic rack. The product was shipped quickly, arrived packaged well, is EXTREMELY high quality, and came with clear instructions on how to install it. I have to say, I could NOT be happier! I mean, LOOK AT IT! It is BEYOND MAGICAL! Now my homemade rack looks pretty pitiful next to this one. Currently I only have my runDisney medals on the new display (of course they are in order from earliest to most recent [Disneyland Half Marathon 2012, TinkerBell Half Marathon 2013, Royal Family 5K, Princess Half Marathon 2013, Coast To Coast, Disneyland 10K 2013, Disneyland Half Marathon 2013, and Dumbo Double Dare 2013], you can thank my OCD for that :)). 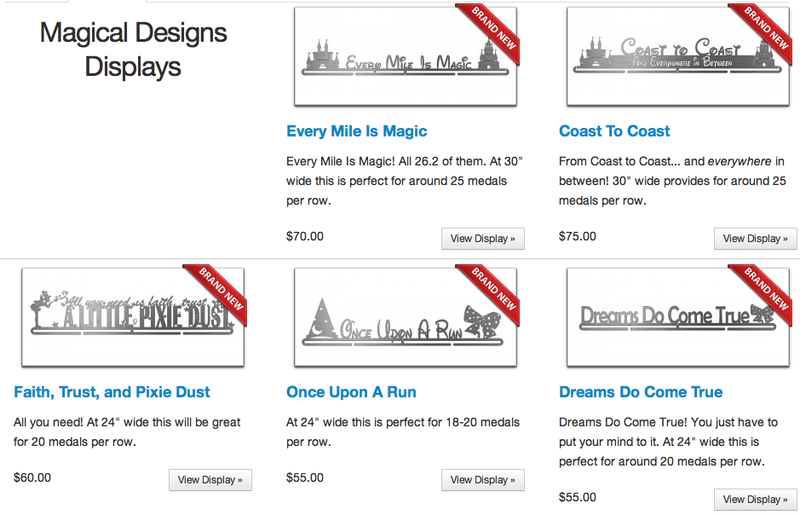 But just because my display is 'magical' does not mean I will only limit it to runDisney bling. If you are in search of a new medal rack, I would HIGHLY suggest you check out Allied Medal Displays. I know you will LOVE the MAGICAL displays, but just in case you want something else they have ones ranging from archery, to cityscapes and everything in-between. You can even request a CUSTOM one created (think ‘blog name’, ‘name and sports number’, motivational quote, etc)! I am SURE you will NOT be disappointed!! I bought a friend the "Give A Girl The Right Pair Of Shoes and She Can Conquer The World" display from Allied Medals and it's awesome! I really, really want one for myself, but I haven't been able to decide yet! I adore Gone For a Run's displays as well. I'm so conflicted!